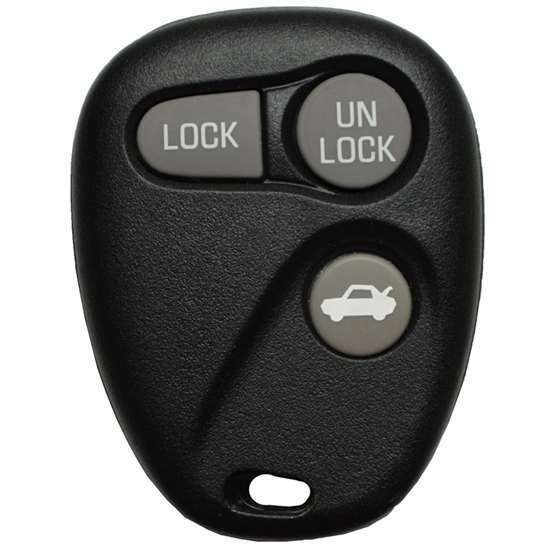 This keyless remote programming instructions work for 3B remote with part # 16245103 trunk, 16245105 rear2x, 16245100-29, 16207901-5, and FCC id AB01502T on the back of it. NOTE: System will terminate all codes of the previously programmed remotes from it's memory after programming a new remote. Just reprogram the existing remotes so you can continue using them. 1. Ignition OFF. 2. 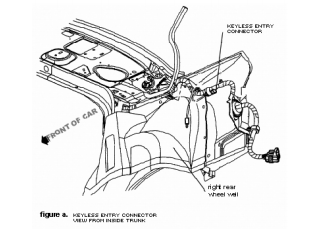 Find Programming Connector in the trunk (center of rear shelf). It's a plastic connector with two wires leading up to it. Connector is unplugged. 3. Programming connector should have two terminals. Connect both terminals using a jumper wire then door locks will cycle (lock then unlock). 4. Press and hold LOCK and UNLOCK buttons on the remote at the same time for 15 seconds or until door locks cycle. 5. To program another remote, go back to step 4 (maximum of 4). 6. Exit programming mode by removing the jumper wire.